After two wonderful days in the desert we continued our tour with Wild Morocco and drove through the vast Iriqui Lake, which could easily have been a setting for Mad Max Fury Road. Then we went past an impressive, jagged mountain range until after nearly two hours of off-road driving we went back into civilization. But before we began this day long drive towards Ait Ben Haddou I undertook one last morning hike into the dunes. 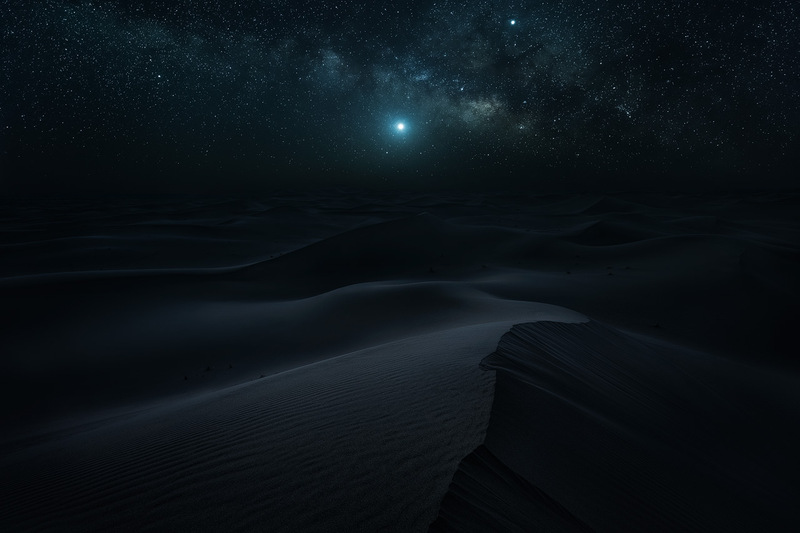 There’s nothing more tranquil than a night in the desert. And there are also few other places where you can see that many stars. So this morning I got up at 5:30am and half an hour later I stood on top of one of the highest dunes near our camp. At that time the Milky Way rose in the east and began its journey across the night sky. With sunrise still two hours away it was still dark enough to clearly see its core. In the photo I took that morning you can also see Venus, which was the brightest object in the sky. I sat there a little longer, waiting for the sun to illuminate the dunes, before I went back to our camp for a delicious breakfast. After that we were off to Ait Ben Haddou where we spent the evening. This place has been a setting for many Hollywood movies and for this reason it’s very touristic. But around sunset the Kasbah wasn’t busy anymore and we were able to explore the narrow alleyways in relative silence. You’ll see some footage of that in the video below. The next day we crossed the Atlas Mountains and drove past Marrakech towards the coast. Our next stop was Essaouira, where we had booked four nights in the wonderful Riad Dar Maya*. The Riad was located right inside the medina and I spent many hours walking around the various streets, looking for scenes to photograph. 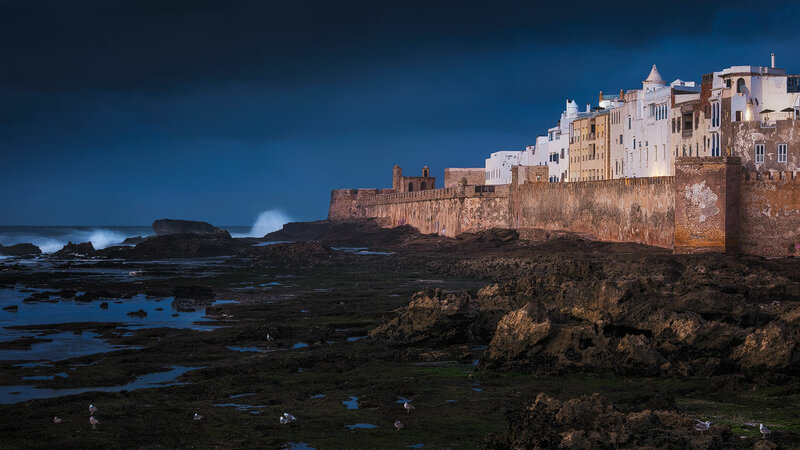 What I liked about Essaouira was the relaxed atmosphere. It’s much less hectic than the medina or Marrakech or Fes and the streets are also not that narrow, which gives you more room to breathe. Another thing that is very characteristic of Essaouira are the countless cats. Everywhere you go you’ll find some drowsy cat sleeping on a bench, a wall or right in the middle of a shop, which is quite cute. Then there is the little harbor with the adjacent fish market. This is the place from which you get the best view of the city. The last evening I climbed on one of the walls there and took some long time exposures during blue hour. With the dark sky above this looked very dramatic, even without the best weather conditions. Then it was time to pack up once more and head off to our next destination, Fes, which was maybe the most interesting place we visited in Morocco. But this story has to wait until the next article.